Fish Machboos / Kabsa | Simple and Delicious ! 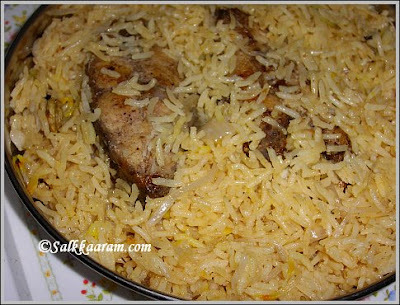 Arabic Rice is also known as Kubsa or Machboos. The one with chicken is always a hit at home. I love it since the preparation time is less and recipe is easy to follow. This is the traditional dish of Arabs and they add lots of raisins and nuts like almonds , pine nuts in this.Some add vegetables too.The Machboos (read makboos) preparation varies from region to region and each Middle east country has its own version of Kubsa Rice. Marinate fish pieces using pepper powder, salt and garlic ginger paste. Heat little oil in a pan and fry the fish pieces. No need to make too crisp. Heat olive oil, add cumin seeds and all spices . Saute chopped onion in this. When it is transparent add tomato paste , washed rice and dried lemon . Add 6 cups boiled water into this. Cook it on a medium heat. When the rice is about 3/4 cooked , reduce heat, add saffron, thyme and place the fish pieces on top.Cover with a lid and cook this on low flame until done. Swich off fire when the rice is cooked. First place the fish pieces into a serving bowl. Then serve rice without breaking the fish pieces. thats a fancy name for the dish :) looks realy yummy! oh i have had this a long time back and tried making it but didn't have a good recipe. will surely try it ur way now.thanks!! Seena, I can't keep up with your blog:) You post so many and they are all mouth-watering:)) You are such an inspiration! This dish looks yummy. We add raisins and other dried stuff to our pilaffs, too, but this recipe is a bit different so I am going to try it. Thanks a lot! Looks delicious Seena. I love Machboos a lot!